With a stay at One Xalapa Las Animas in Xalapa, you'll be within a 15-minute drive of Juarez Park and Xalapa University. This eco-friendly hotel is 0.5 mi (0.9 km) from Plaza Las Animas Mall and 1.6 mi (2.5 km) from Interactive Museum of Xalapa (MIX). 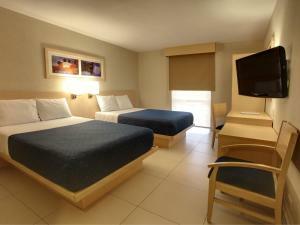 Make yourself at home in one of the 126 air-conditioned rooms featuring flat-screen televisions. Complimentary wireless Internet access keeps you connected, and cable programming is available for your entertainment. Private bathrooms with showers feature complimentary toiletries and hair dryers. Conveniences include phones, as well as desks and blackout drapes/curtains. Enjoy a satisfying meal at Cafe la Fiesta serving guests of One Xalapa Las Animas. A complimentary buffet breakfast is served daily from 7 AM to noon. Featured amenities include a computer station, express check-out, and laundry facilities. When would you like to stay at One Xalapa Las Animas ? Each day we'll check prices and send you an email for your selected dates at One Xalapa Las Animas. If you don't have specific dates but would like to check prices for say next weekend or say next month we can check the price too. Click to write a review and share your experience of One Xalapa Las Animas with other travellers.